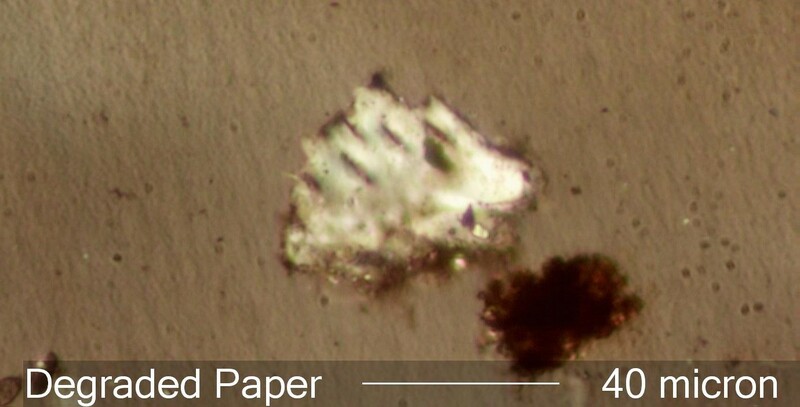 This degraded paper fiber is from an oil sample collected from a 8400kVA transformer. This transformer was reportedly gas blanketed and sealed. The presence of this paper fiber and others similarly degraded indicates severe aging of the paper insulation in some areas. Paper is used as a primary insulation in the core of transformers. This material will degrade hydrothermally like other cellulose materials in a transformer over time. Hydrothermally paper fiber often exhibits tears normal to the long axis of the fiber. The birefringence is typically below 0.01 by the time these tears are evident. The paper fiber may be quite irregular in shape, having lost mechanical integrity in all layers of the fiber.